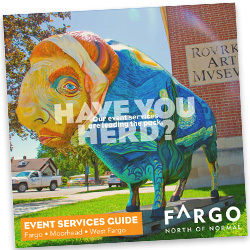 The Event Services team at the Fargo-Moorhead Convention & Visitors Bureau offers years of experience and creative solutions to add that final sparkle to your professionally orchestrated event. We will create your convention registration database and assist you with the registration process. Holders and inserts for name badges will be provided. These can be pre-typed with delegate information and your logo. Equipment for typing name badges on-site can also be provided for use at your registration desk. Badges will be organized and easy to handle during registration. Qualifying organizations can utilize our automated reservation services. We will design a customized housing form to meet your needs. Registration personnel along with the latest registration equipment will be available during your convention. Visitor Guides with a city map, attractions, and gourmet guides will be available for your registration or information table. A “Welcome” banner as well as informational/directional posters are complimentary or at a nominal fee. We will assist you with news releases and news conferences. Arrangements can be made to have a city official write a welcome letter for your attendees’ welcome packets. Should you desire transportation service, we’ll be happy to coordinate your shuttle service. We can provide schedules as well as signage. The CVB can assist in coordinating guest and family programs, educational and recreational tours, and offer suggestions for “down time” activities.